Going to do an oil change on your R56,R55,R57, R58 or R59? Here is a great upgrade and way to get rid of that silly allen wrench drain plug. This will not only make changing your oil easier, but alot cleaner and keep metal out of the oil. The continuous wearing of moving parts in your vehicle's power train results in microscopic ferrous metal particles becoming trapped in the lubricating oil, which causes unnecessary damage to your engine, transmission, differential and/or trans-axle. Although magnets have been used to remove these ferrous metal particles from lubricating oil since the 1930's, they have been largely ineffective under high temperature conditions, because most magnets lose their magnetism under extreme heat conditions. The only way to remove these small damaging metal particles is with very strong high temperature magnets. This is a great addition while doing an oil change for some added insurance and peace of mind. 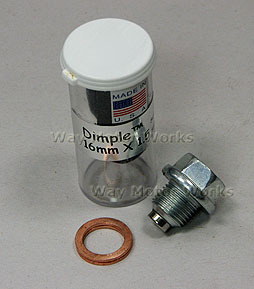 Kit includes magnetic drain plug for engine oil and a reusable sealing ring.